Click for complete information on "The Creeks and Rivers of Silicon Valley"
Did you know Charlie Chaplin filmed his first "Little Tramp" movies, not in Hollywood, but in the San Francisco Bay area? Did you know there is an actual ghost town in the middle of Silicon Valley? Did you know there are wild beaver right in downtown San Jose? Long before the Wright Brothers, John Montgomery did some of the first controlled air flights in San Jose. Besides the paintings, the book is chock full of interesting history, and little known facts about each painting location! You don't really know Silicon Valley until you have read this book! Once a lush agrarian area, Santa Clara Valley, AKA Silicon Valley, still has hidden little places buried in the urban and suburban sprawl. Tucked away in back alleys, under freeways, and behind fences are wonderful little scenes people hardly notice in the rush of modern life. With an eye for these hidden treasures, as both a successful Silicon Valley entrepreneur, and now an internationally acclaimed artist, Donald Neff started a yearlong quest to once a week paint a creek, river, or waterway of Santa Clara Valley en plein air. Plein Air is a French term which means painted on location. Neff’s goal is to help everyone appreciate more the wonderful variety of what used to be called “The Valley of Heart’s Delight,” which seems to be lost in the urban and suburban sprawl. He also wanted to raise interest in preserving our city creeks, waterways, and other natural areas. 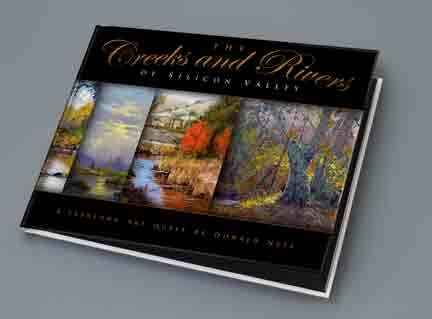 Sixty paintings of 43 creeks are represented in locations all over Santa Clara Valley and the South San Francisco Bay area, painted from November 2013 to November 2014. All paintings, save one acrylic, are oil on 8x10 inches canvas board. The book is also 8x10 so all paintings are shown actual size. © Copyright 2001-2003 Donald Neff. All rights reserved.